I don’t know about where you live but here in the Pacific Northwest fall has moved in. It’s finally time to dig out the heavy-duty dog jackets so we can continue to walk, hike, bike and camp through the fall and winter. A few months ago when I went to the Washington State Pet Expo I picked up a great cold-weather jacket for Gretel from The Cozy Hound. 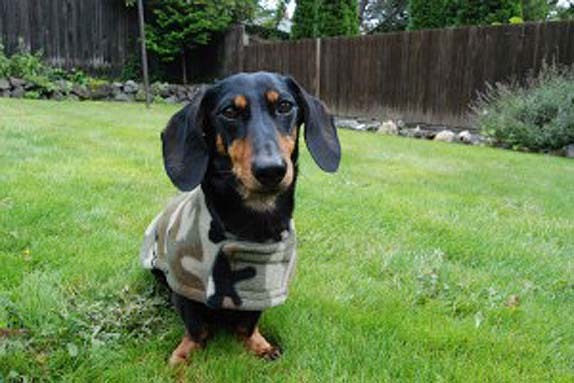 I have seen a lot of Doxie jackets but I was especially drawn to these by the fun prints, the quality of the fleece and the very reasonable price. UPDATE: January 25, 2019 – The owner of The Cozy Hound has drastically scaled her business back and no longer offers orders online from the general public. However, because I have been such great supporters over the years, she is still willing to make them for my readers. Please email her directly at thecozyhound@comcast.net to place your order. 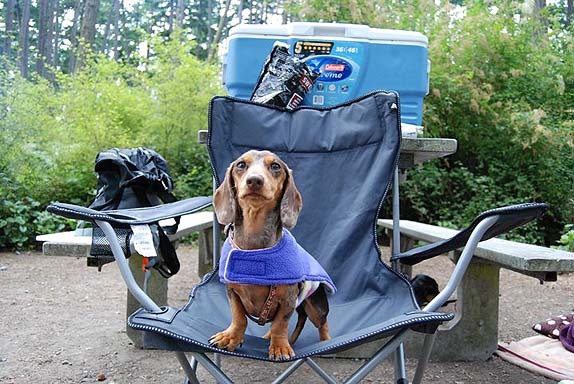 For fleece jackets for your Dachshund you can view and purchase online, check out my article about dog fleece coats that fit long bodies. Since pets weren’t allowed at this expo I had to guess when it came to choosing a size for Gretel. When I got home I was pleasantly surprised that it fit her perfectly. Gretel wore the jacket for a couple of months and I liked the jacket so much I contacted The Cozy Hound to get one for Chester. I sent in his measurements and, again to my pleasant surprise, when the jacket came in the mail it fit perfectly! I have “custom ordered” several jackets for the dogs through the mail before but not once have any of them fit just right. This either resulted in my giving the jacket away or paying to send it back in the mail to be adjusted (and in some cases I had to send it back several times). It was such a relief to get one that fit right the very first time. The jackets are made of double thick fleece. This makes them great for activity in really cold weather or for dogs with less meat on their bones that get cold very easy (like Gretel). It’s like a wearable blanket. The Cozy Hound specializes in fleece dog coats but can make coats in other types of materials if requested. The fleece jackets come in a variety of fun, colorful prints and they are reversible – so it is really like getting two coats in one. We love The Cozy Hound because we like the idea that the owner sits and looks at the same beautiful Puget Sound we live by while making our dog jackets. We also love them because these jackets are made BY a Doxie owner (she has four) FOR Doxies. The Cozy Hound Gang: Max, Lilly, Oscar and Winston. Photo courtesy of The Cozy Hound. She really understands the challenge of trying to find coats to fit their long bodies and big chests and has come up with her own pattern that, in our experience, fits perfectly. These are our favorite dog coats so far. Besides being thick and quality made, we found the Velcro to be very strong and love that they are machine washable. We get our coats so dirty on our outdoor adventures that we need to be able to throw them in the washer and have another one on hand to use in the meantime. We are definitely going to order more of these jackets! I mean, look at this handsome guy! If you want to get one of these jackets yourself, you can email the The Cozy Hound owner at thecozyhound@comcast.net to get more details and place your order. Disclaimer: After purchasing and falling in love with our first jacket, The Cozy Hound looked over my review policy and agreed to send me a jacket for Chester in exchange for a product review. I was not paid for the review of this product and all thoughts are my own. I wanted to share this product with you only because I think it is so great. The kids look so cute in their new threads! Snug as a bug in a rug! Do you have any recommendations for a jacket that also covers the belly well, but doesn’t get in the way of the legs too much? Our dog’s belly is really naked! Also, our dog is female – are there jackets and sweaters out there that cover that poor cold little part of the belly that females don’t need uncovered like males do? The one we use when I want to cover Chester’s chest is a jacket from Ruff Wear. I can’t remember the name right now but it is red with rip-stop nylon on the outside and a thin fleece on the inside. He hikes in it fine because it gives plenty of room for his legs. I am not sure if the XS would be small enough for LeeLoo though. It also doesn’t cover the belly – which is fine because he is a boy 🙂 The only ones I know that do that are the pajama-like sweatshirts. I wouldn’t take the dogs hiking in those though because it seems it would restrict their natural movement. These look perfect for cold Ottawa winters! I wonder if they ship to Canada! (Will inquire). 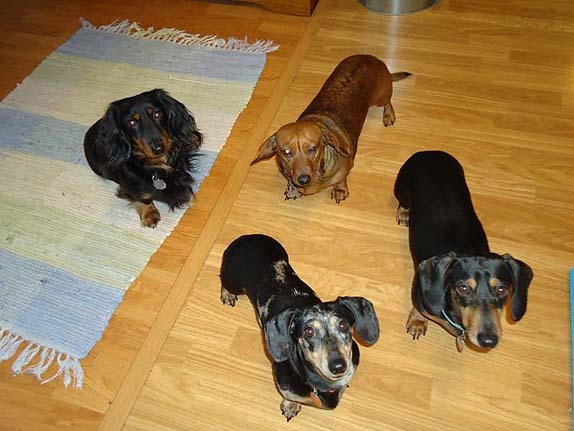 Do you Havel standard daschund size? No. Gretel is a Mini at 10 lbs (the weight limit is 11 lbs for a mini) and Chester is technically a tweenie at 12….or 11 on non-fat days. Ha, ha. 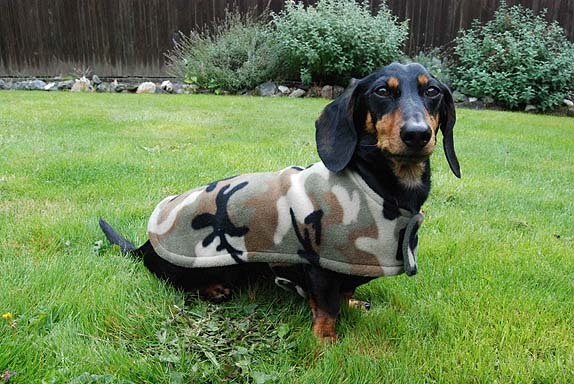 These jackets can be custom made to fit any size Dachshund though. I bought a med and it was huge on my mini daughoubd he is overweight at 14 lbd. So i will be returning it first jacket with the short sleeves on it. Hi Lisa. Sorry it didn’t work out. I know what size to get now but, initially, I gave Chris Chester and Gretel’s measurements and let her pick the best size. In fact – and I don’t know if she still does because we bought our first jacket from her years ago but – she custom made our jackets for the same price listed on her website. Anyway, if you do contact her about an exchange, tell her you know about the review on my blog. I saw you wrote this review in 2011. Is The Cozy Hound still in business (in 2019)? I haven’t been able to access the website. Ahhh, sorry. I thought I updated this article. I’ll put it on my to-do list. Chris has drastically scaled her business down and no longer offers orders online from the general public. However, because I’ve helped advertise her jackets over the years, she is still willing to make them for my readers. Please email her directly at thecozyhound@comcast.net to place your order.